Sporting the bold old School design, the speaker inspires a retro vibe in the ambiance that will leave a paramount impression on everyone that beholds the masterpiece. Pump up the atmosphere with club like speaker illuminations on the LED Display. Zebronics India Pvt. 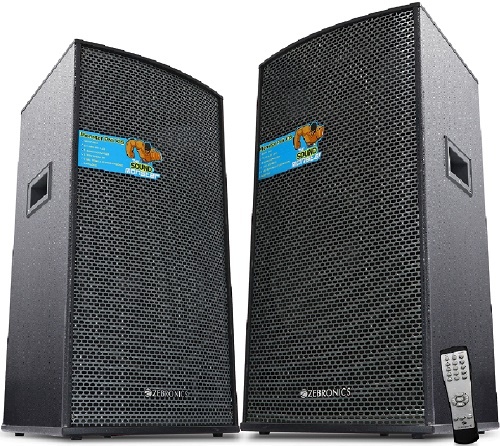 Ltd, India’s leading supplier of IT peripherals, Audio/Video and Surveillance products, yet again bring another ingenious addition to its advancing range of Tower speakers, this time unveiling its latest addition, the ‘Monster Pro X15 Tower speakers’. True to its name, the speakers sport the 180w RMS of Monstrous Sound, to amplify your music experience to club –like sound. Redefining the term Loud, bring home the party with the 2-way speaker system. This dual unit speaker set is integrated with a whopping 180W of total output RMS and 15X2 drivers that delivers a thunderous sound output without any distortion, even at the highest volumes intensifying your listening/Music experience. A complete must-have for all mixing enthusiasts and party DJs, the Monster Pro X15 is equipped with advanced DJ functionalities that let’s you tune every aspect of your audio easily, the speaker has a dedicated control panel that includes 5 Band equaliser, Individual Volume, Bass and treble control for MIC & Guitar & Master Control as well enabling you to tune your music the way you like. Furthermore, you can also adjust the left & right channel volume level individually. Now invite your friends over for a Karaoke night or unleash your inner guitar hero with the Monster Pro X15 comes with Dual wireless mic and option to add two more mics with wires or even a guitar and ensures that your vocals reach every corner of your room. With the sound, loud enough to make your neighbours complain, Pro X15 lets you pair it any Bluetooth enabled devices like tablets, smartphones & more easily. The speaker also has dual 3.5mm mini-jack input that allows you to connect almost any music device with RCA/Stereo out. Simply plug in and easily enjoy your music. Additional connectivity options like USB & SD Card are also included. To give you complete wireless freedom, the speakers also has a wireless remote that gives you total control over the speaker even at a distance. The Perfect loud speakers for large rooms, the Monster Pro X15 delivers truly unrivalled sound quality and value. Treat yourself with the rich audio quality of Monster Pro X15 today. The product is already available in leading retail stores across India.